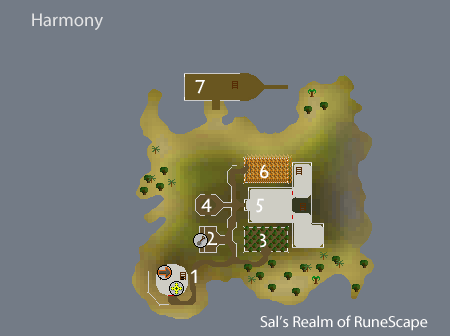 Harmony is a small island, home to monks that worship the God of Wisdom, Saradomin. Despite the size of Harmony Island, you can find some interesting attractions. To travel to Harmony, you must speak with Brother Tranquility near the entrance boating dock at Mos Le'Harmless. Agree to help him and you will start the quest, The Great Brain Robbery. Brother Tranquility will teleport you to a windmill on the island of Harmony. There, you will need to complete the quest if you want the freedom to travel around Harmony without wearing special protection gear, which include a Diving Apparatus and a Fishbowl Helmet. 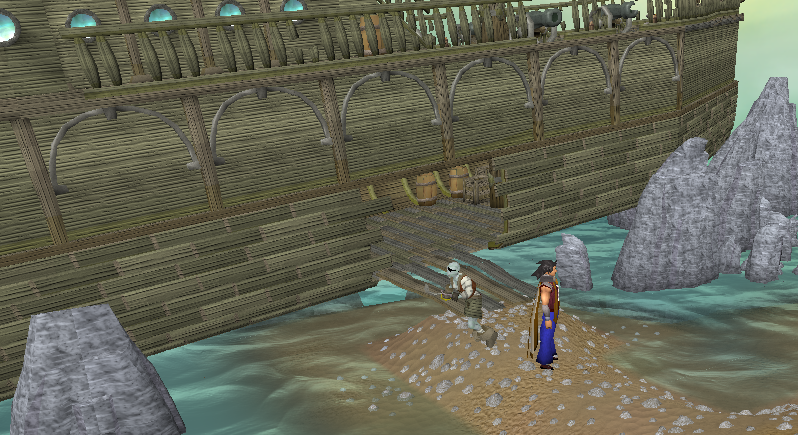 On Harmony Island, you can find a monastery, an allotment patch, a shipwreck, and more. This is the location of where you will appear when Brother Tranquility teleports you. This windmill has the same features as the ones north of East Ardougne, northeast of Draynor Village, and everywhere else in Runescape: to make flour. The windmill consists of four floors: ground floor, middle floor, top floor, and basement. The ground, middle, and top floors are used to make flour. Also, two to three monks can be found on the top and middle floor. On the ground floor, there are four monks, including Brother Tranquility who can teleport you back to Mos Le'Harmless. In the basement, you can find Dr. Fenkenstrain. He plays a key role in the quest, The Great Brain Robbery. You can pickpocket the Doctor for the Ring of Charos (a). 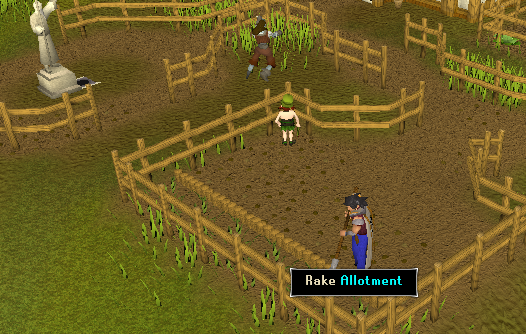 Northeast of the windmill is a single allotment patch used with the Farming skill. Unlike usual allotment patches, this one is not surrounded with an herb patch and a flower patch. Nonetheless, you can still find the lovable little Tools Leprechaun. 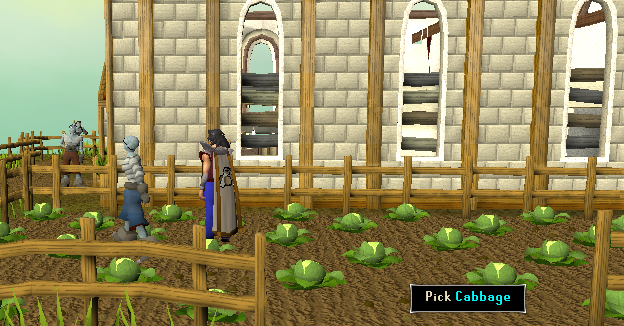 East of the allotment patch is a cabbage patch, containing 32 cabbages you can pick from the ground. During the quest, The Great Brain Robbery, you need to push this statue to reveal a ladder. This ladder will take you into an underwater cavern. In order to survive in the cavern, you'll need a diving apparatus and fishbowl helmet. Some armor is also recommended because of the zombie pirates that lurk in the water. 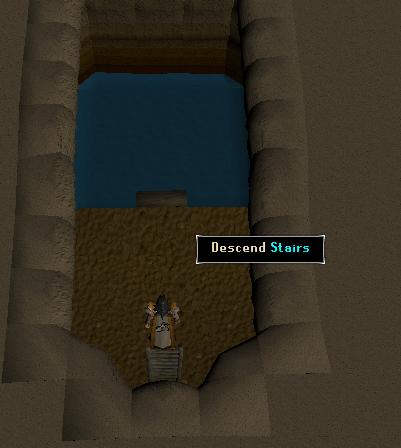 At the other end of the cavern, there is a broken set of stairs. You will need some planks and nails to repair these. The steps lead to an enclosed room in the monastery. The monastery is east of the Saradomin statue. This monastery is unlike the usual ones. 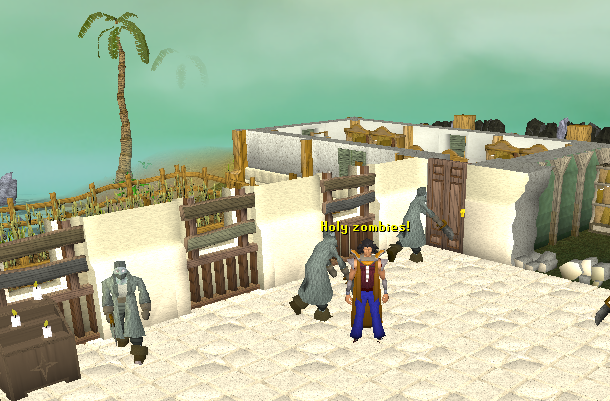 Its main entrance door has been destroyed, there are broken walls, and creatures called Sorebones have invaded the building. The monastery plays an important role in the quest, The Great Brain Robbery. You fight the final boss in the entrance hall. The boss is level 190 and is named Barrelchest. Also, you are required to kill Sorebones to collect cranial clamps, brain tongs, bell jars, and skull staples. These items are used in the surgery procedure during the quest. Upstairs in the monastery, you can find more Sorebones and some empty beds. North of the monastery is a wheat field. 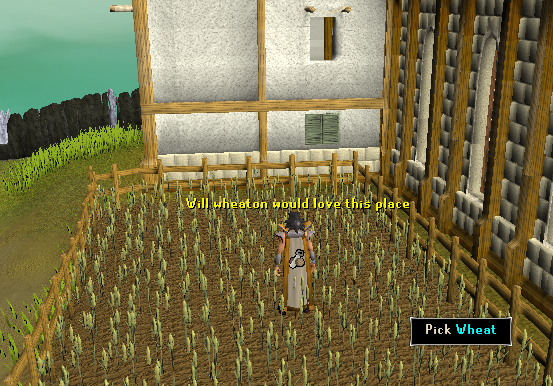 Here, you can collect wheat to make flour at the windmill. At the very north section of Harmony Island, there are the remains of a shipwreck. The good news is that you can still explore the remains. On the bottom floor of the ship, there are two zombie pirates and a small locker against the west wall. This locker contains fuses. 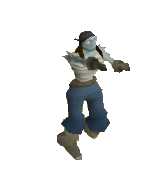 Moving up to the next floor, you can find more zombie pirates. There are also keg respawn points and a tinderbox respawn. The fuse, keg, and tinderbox are used to blow down the entrance door of the monastery during the quest, The Great Brain Robbery.